An economy’s rate of productivity growth is closely linked to the growth rate of its GDP per capita, although the two are not identical. For example, if the percentage of the population who holds jobs in an economy increases, GDP per capita will increase but the productivity of individual workers may not be affected. Over the long term, the only way that GDP per capita can grow continually is if the productivity of the average worker rises. A common measure of U.S. productivity per worker is the dollar value per hour the worker contributes to the employer’s output. This measure excludes government workers, because their output is not sold in the market and so their productivity is hard to measure. It also excludes farming, which accounts for only a relatively small share of the U.S. economy. 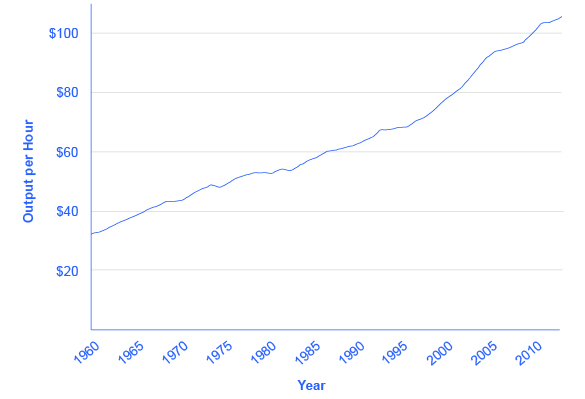 Figure 1 shows that the average amount produced by a U.S. worker in an hour averaged over $100 in 2011, more than twice the amount an average worker produced per hour in 1966. According to the Department of Labor, U.S. productivity growth was fairly strong in the 1950s but then declined in the 1970s and 1980s before rising again in the second half of the 1990s and the first half of the 2000s. In fact, the rate of productivity measured by the change in output per hour worked averaged 3.2% per year from 1950 to 1970; dropped to 1.9% per year from 1970 to 1990; and then climbed back to over 2.3% from 1991 to the present, with another modest slowdown after 2001. 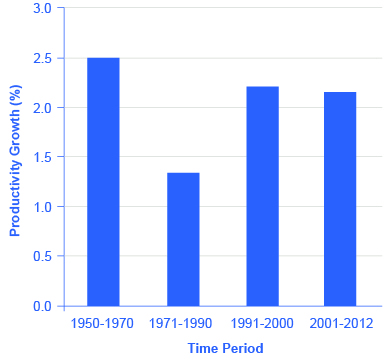 Figure 2 shows average annual rates of productivity growth averaged over time since 1950. In recent years a controversy has been brewing among economists about the resurgence of U.S. productivity in the second half of the 1990s. One school of thought argues that the United States had developed a “new economy” based on the extraordinary advances in communications and information technology of the 1990s. The most optimistic proponents argue that it would generate higher average productivity growth for decades to come. The pessimists, on the other hand, argue that even five or ten years of stronger productivity growth does not prove that higher productivity will last for the long term. It is hard to infer anything about long-term productivity trends during the later part of the 2000s, because the steep recession of 2008–2009, with its sharp but not completely synchronized declines in output and employment, complicates any interpretation. Productivity growth is closely linked to the average level of wages. Over time, the amount that firms are willing to pay workers will depend on the value of the output those workers produce. If a few employers tried to pay their workers less than what those workers produced, then those workers would receive offers of higher wages from other profit-seeking employers. If a few employers mistakenly paid their workers more than what those workers produced, those employers would soon end up with losses. In the long run, productivity per hour is the most important determinant of the average wage level in any economy. When society increases the level of capital per person, the result is called capital deepening. The idea of capital deepening can apply both to additional human capital per worker and to additional physical capital per worker. Recall that one way to measure human capital is to look at the average levels of education in an economy. 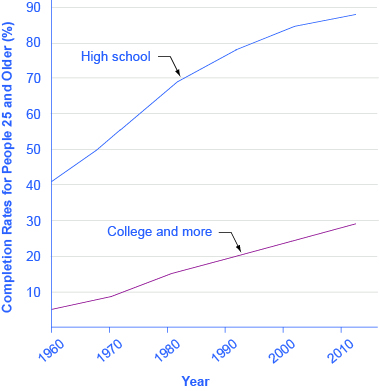 Figure 3 illustrates the human capital deepening for U.S. workers by showing that the proportion of the U.S. population with a high school and a college degree is rising. As recently as 1970, for example, only about half of U.S. adults had at least a high school diploma; by the start of the twenty-first century, more than 80% of adults had graduated from high school. The idea of human capital deepening also applies to the years of experience that workers have, but the average experience level of U.S. workers has not changed much in recent decades. Thus, the key dimension for deepening human capital in the U.S. economy focuses more on additional education and training than on a higher average level of work experience. Figure 3. Human Capital Deepening in the U.S. Rising levels of education for persons 25 and older show the deepening of human capital in the U.S. economy. Even today, relatively few U.S. adults have completed a four-year college degree. There is clearly room for additional deepening of human capital to occur. (Source: US Department of Education, National Center for Education Statistics). Physical capital deepening in the U.S. economy is shown in Figure 4. The average U.S. worker in the late 2000s was working with physical capital worth almost three times as much as that of the average worker of the early 1950s. Figure 4. Physical Capital per Worker in the United States. The value of the physical capital, measured by plant and equipment, used by the average worker in the U.S. economy has risen over the decades. The increase may have leveled off a bit in the 1970s and 1980s, which were not, coincidentally, times of slower-than-usual growth in worker productivity. We see a renewed increase in physical capital per worker in the late 1990s, followed by a flattening in the early 2000s. (Source: Center for International Comparisons of Production, Income and Prices, University of Pennsylvania). Not only does the current U.S. economy have better-educated workers with more and improved physical capital than it did several decades ago, but these workers have access to more advanced technologies. Growth in technology is impossible to measure with a simple line on a graph, but evidence that we live in an age of technological marvels is all around us—discoveries in genetics and in the structure of particles, the wireless Internet, and other inventions almost too numerous to count. The U.S. Patent and Trademark Office typically has issued more than 150,000 patents annually in recent years. This recipe for economic growth—investing in labor productivity, with investments in human capital and technology, as well as increasing physical capital—also applies to other economies. In South Korea, for example, universal enrollment in primary school (the equivalent of kindergarten through sixth grade in the United States) had already been achieved by 1965, when Korea’s GDP per capita was still near its rock bottom low. By the late 1980s, Korea had achieved almost universal secondary school education (the equivalent of a high school education in the United States). With regard to physical capital, Korea’s rates of investment had been about 15% of GDP at the start of the 1960s, but doubled to 30–35% of GDP by the late 1960s and early 1970s. With regard to technology, South Korean students went to universities and colleges around the world to get scientific and technical training, and South Korean firms reached out to study and form partnerships with firms that could offer them technological insights. These factors combined to foster South Korea’s high rate of economic growth. 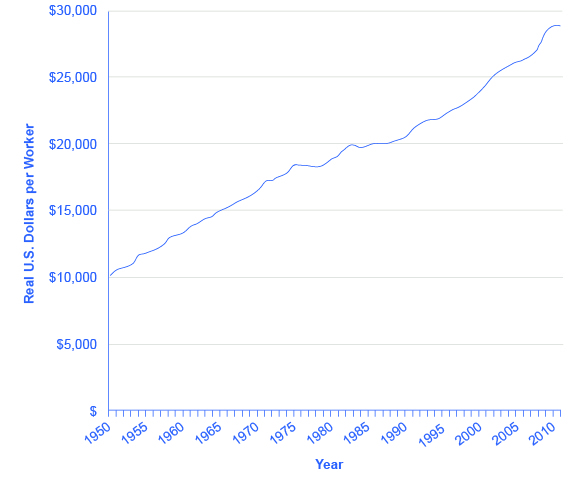 Since the late 1950s, economists have conducted growth accounting studies to determine the extent to which physical and human capital deepening and technology have contributed to growth. The usual approach uses an aggregate production function to estimate how much of per capita economic growth can be attributed to growth in physical capital and human capital. These two inputs can be measured, at least roughly. The part of growth that is unexplained by measured inputs, called the residual, is then attributed to growth in technology. The exact numerical estimates differ from study to study and from country to country, depending on how researchers measured these three main factors over what time horizons. For studies of the U.S. economy, three lessons commonly emerge from growth accounting studies. First, technology is typically the most important contributor to U.S. economic growth. Growth in human capital and physical capital often explains only half or less than half of the economic growth that occurs. New ways of doing things are tremendously important. Second, while investment in physical capital is essential to growth in labor productivity and GDP per capita, building human capital is at least as important. Economic growth is not just a matter of more machines and buildings. One vivid example of the power of human capital and technological knowledge occurred in Europe in the years after World War II (1939–1945). During the war, a large share of Europe’s physical capital, such as factories, roads, and vehicles, was destroyed. Europe also lost an overwhelming amount of human capital in the form of millions of men, women, and children who died during the war. However, the powerful combination of skilled workers and technological knowledge, working within a market-oriented economic framework, rebuilt Europe’s productive capacity to an even higher level within less than two decades. A third lesson is that these three factors of human capital, physical capital, and technology work together. Workers with a higher level of education and skills are often better at coming up with new technological innovations. These technological innovations are often ideas that cannot increase production until they become a part of new investment in physical capital. New machines that embody technological innovations often require additional training, which builds worker skills further. If the recipe for economic growth is to succeed, an economy needs all the ingredients of the aggregate production function. See the following feature about girl’s education in low-income countries for an example of how human capital, physical capital, and technology can combine to significantly impact lives. HOW DO GIRLS’ EDUCATION AND ECONOMIC GROWTH RELATE IN LOW-INCOME COUNTRIES? In the early 2000s, according to the World Bank, about 110 million children between the ages of 6 and 11 were not in school—and about two-thirds of them were girls. In Bangladesh, for example, the illiteracy rate for those aged 15 to 24 was 78% for females, compared to 75% for males. In Egypt, for this age group, illiteracy was 84% for females and 91% for males. Cambodia had 86% illiteracy for females and 88% for males. Nigeria had 66% illiteracy for females in the 15 to 24 age bracket and 78% for males. Whenever any child does not receive a basic education, it is both a human and an economic loss. In low-income countries, wages typically increase by an average of 10 to 20% with each additional year of education. There is, however, some intriguing evidence that helping girls in low-income countries to close the education gap with boys may be especially important, because of the social role that many of the girls will play as mothers and homemakers. Girls in low-income countries who receive more education tend to grow up to have fewer, healthier, better-educated children. Their children are more likely to be better nourished and to receive basic health care like immunizations. Economic research on women in low-income economies backs up these findings. When 20 women get one additional year of schooling, as a group they will, on average, have one less child. When 1,000 women get one additional year of schooling, on average one to two fewer women from that group will die in childbirth. When a woman stays in school an additional year, that factor alone means that, on average, each of her children will spend an additional half-year in school. Education for girls is a good investment because it is an investment in economic growth with benefits beyond the current generation.